One Cartridge not a box: .577 Black Powder Express, factory produced by Kynoch or England, before the 1930s using a (then) new 3" case with “Kynoch .557" Head-Stamp and loaded with a 570 grain “COPPER TUBE” lead projectile. A very hard find today, from the box in the picture. Obsolete since 1930's make this app. 90 years old. The 577 B.P. 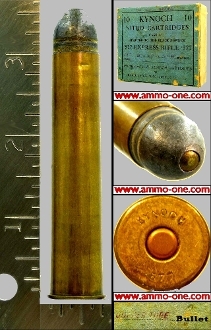 Express (B.P.= Black Powder) was introduced in the early 1870's with a 2&1/2" case and later in 2&3/4", 3" and 3&1/4" versions which basically replaced the 577 Snider variants. The Black power charge was a huge 135 to 190grains of black powder. it was loaded with (the then) new "Cordite" smokeless powder. This is a very hard item to find today.